Mike Piazza, who arrived Wednesday in Cooperstown, N.Y., has written, prepared and rehearsed his Hall of Fame speech to perfection. But when he’s standing on stage during Sunday’s induction ceremony, it might be for naught. Perhaps no man in baseball history has overcome greater odds and taken a stranger journey into baseball’s Hall of Fame. The ultimate model in perseverance, Piazza realizes that Sunday he’s going to be unable to perform the simplest of tasks. Sorry, he says, but he simply cannot look into the audience and peer into the face of his father, Vince Piazza. He can’t turn around and look into the eyes of Tommy Lasorda, a longtime family friend who’ll be sitting on stage with the other Hall of Famers. If Piazza tries that, he’s convinced, he will crumble. Well, to be perfectly candid, Vince Piazza and Lasorda believed in Piazza when no one else in the world did. Vince relentlessly tried to construct the perfect hitter on his Pennsylvania estate, building an indoor batting cage on his property, even summoning Hall of Famer Ted Williams to study his son’s swing, believing Mike one day would be in the big leagues. And it was Lasorda who begged and pleaded for his own organization, the Los Angeles Dodgers, to draft him. 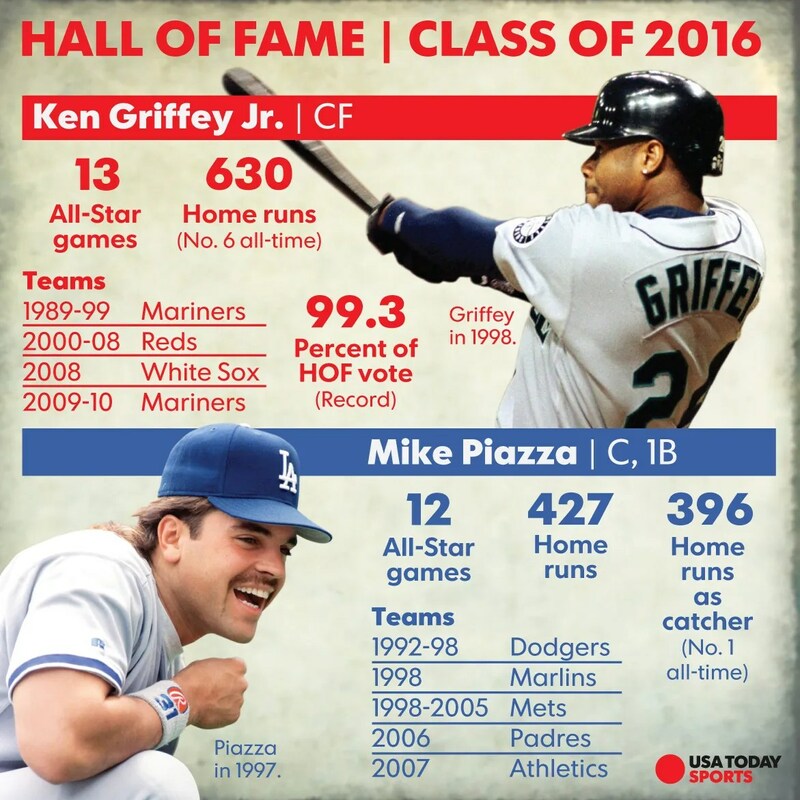 Piazza was selected in the 62nd round, the lowest draft pick to reach the Hall of Fame, a distinction that will stand, considering the draft no longer extends past 50 rounds. He’ll share the stage with Ken Griffey Jr., his polar opposite, who will become the first player ever to be the first selection in a draft and make the Hall of Fame. Then again, it’s hard to even classify Piazza as a draft pick. He was drafted only as a courtesy to Lasorda, who happened to be a childhood friend of Vince Piazza’s. “The Dodgers didn’t want him,” Lasorda told USA TODAY Sports. “Nobody wanted him. I kept telling our guys, ‘I want him drafted. I don’t care where or when, but draft him.’ So they draft him, and then they don’t even contact him. The Dodgers didn’t bother calling Piazza for two full months after the draft. They were hoping he’d simply go away. When the Dodgers finally took a look at him, they didn’t want him. Piazza signed for $15,000 but was told that if he wanted to be a catcher, he’d have to learn the position at their academy in the Dominican Republic. The Dodgers had never sent an American player to their Dominican camp. Piazza, who didn’t know a word of Spanish, went to the Dominican Republic, and it was the first time he ever caught future Hall of Fame pitcher Pedro Martinez. Piazza walked away from the game at Class A Vero Beach (Fla.), telling the Dodgers he was quitting and going home, only to return two days later and become the greatest power-hitting catcher in baseball history. “It was a blessing and sometimes a little bit of a tough thing to be associated with Tommy,” Piazza said. “It was just one of those things that I was having trouble learning the catching position, and then struggling, wasn’t getting along with some of the staff. Eric Karros, Piazza’s closest friend with the Dodgers, having been drafted in the same year but 56 rounds earlier, vividly remembers the abuse. “It wasn’t a good situation,” Karros said. “It’s almost like they had it in for Mike. All you ever heard was that this guy was here because of his relationship with Tommy. Now, 28 years, 12 All-Star selections and 427 home runs later, Piazza can regale as baseball’s shining knight of perseverance. These attributes kept Piazza strong, even when he was traded from the Dodgers to the then-Florida Marlins in 1998, a deal that blindsided then-general manager Fred Claire. The Dodgers, then owned by Fox, orchestrated the trade without his knowledge. Claire was furious, threatened to resign and was fired a year later. Piazza was traded again a week later to the New York Mets. In two years, they were in the World Series. The Dodgers have yet to reach the World Series since Piazza was dealt. “They never should have traded him,” Lasorda said. “They made the biggest mistake of their lives. Piazza, 47, was never bitter throughout his bizarre route to Cooperstown. He never carried a grudge. Never even resented that every single baseball franchise passed on him at least 61 times in that fateful draft, with 1,389 players selected before him. “To be honest,” said Karros, who will be at the induction ceremony with his 13-year-old son, “it was his dad that was always his motivating factor. His dad was going to create this hitter, and there was nothing more in life that Mike wanted but to please his dad. And to think, if not for his father’s friendship with Lasorda in Norristown, Pa., Piazza never would have worn a professional baseball uniform. He figures he likely would have spent the rest of his life working with his dad, operating car dealerships, running the family business and catching a few ballgames in his spare time. So, Piazza asks, how could it be possible for him Sunday to look at his dad, who nearly died three years ago from a massive stroke, or Lasorda, without breaking down himself? “Believe me, there’s going to be enough tears coming from me and Vince,” Lasorda said. “How can anyone not be emotional, knowing what this kid has gone through and what he made of himself?